Aaron Scott was third Englishman home in the London Marathon. Many local distance running specialists descended upon the capital on Sunday to race the iconic 26.2 mile London Marathon course from Blackheath to The Mall. Stamford-based speedster Aaron Scott stole the show with an outstanding run which saw the Notts AC athlete finish 25th overall and third Englishman in a time of 2:19.18. Scott was determined to get under 2:20 on the streets of London after narrowly failing for the past two years. And he took full advantage of the cool conditions to run a near perfect race keeping a consistent pace throughout. Reflecting on his run Scott was clearly delighted as he enthused: “The race went to plan and I was delighted with my time. “I felt brilliant through halfway and kept holding things back. “We picked up from 20 to 25k and a group of eight went down to a group of four. “Again I felt good at 30k so pushed on again only to find myself on my own and running into a stiff breeze. Scott could be a contender for the 2018 Commonwealth Games if he makes that improvement. Yaxley’s James Mogridge crossed the line in 177th position, lowering his personal best (PB) by four minutes with a time of 2:36.22, while team-mate Michael Morley finished in 2:56.59. Thomas Musson of Werrington Joggers clocked 2:39.28 and acknowledged that this was the finest performance of his two-year running career. Finishing just outside the top 200, the 32 year-old obliterated his previous fastest time of 2:48, set in Berlin last autumn. Musson paid tribute to the fine support on the course saying: “My quads tightened very early on but I had company at the right times to brave it out. Bushfield Jogger Phil Martin was delighted with his time of 2:39.28, finishing 210th, only four weeks after returning to running following an injury lay-off. Martin’s Bushfield team-mates James Fisher and Barry Ryan got round in just over three hours, recording times of 3:02.28 and 3:04.10 respectively. Nene Valley Harriers’ best performer was 50 year-old Dave Neal with a 2:57.30 clocking. Harriers Simon Bell, Chris Mooney, Oliver Slater, Barry Warne and Mike Chapman all finished among the top 4,000 in a field of over 40,000. 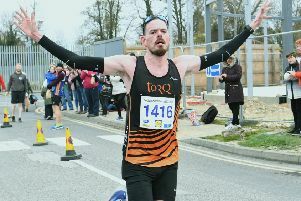 Marathon machine Martin Stevens of Werrington Joggers recorded his 15th sub three-hour race, while former Joggers star Anthony Johnson, now running for Kent AC, finished 112th in a speedy 2:33.59. No-one is likely to have trained harder for the big day than Peterborough AC stalwart Steven Hall. He reaped the rewards of his labours with a 2:51.38 clocking. Thorney’s Darren Ping and Kirk Brawn dipped under three hours, but the club’s star performer was veteran Sharon Hodgkin, who ran 3:23.33 on her marathon debut. Suzy West of Eye Community Runners was the speediest local lady. West races sparingly, but impresses whenever she competes. Her 3:02.55 clocking placed her 76th lady. Sarah Overington ran a fine 3:14.37, despite cramping badly in the final few miles. Stamford Striders had the biggest turnout of the local clubs with 19 finishers. And had there been a prize for the fastest husband and wife combination, the Skinners would surely have been in contention, with James running a superb 2:40.44, and his wife Maggie finishing as the second fastest local lady in 3:04.05. The 36 year-old had looked to be in with a chance of dipping under three hours for the first time until slowing in the final five miles. Kate Nicolas also acquitted herself well with a 3:14.37 clocking. The ever-reliable Jim Morris finished 19th over 50 with a fine time of 2:48.31. Mark Popple went under three hours with 2:55.22, while veterans Dave Aust, Ed Fancourt and Mark Anderson all ran well. March AC boasted three of the best performers on the day with veterans Geraldine Larham and Karen Patterson making the top 35 in the over 45 age group. Debra Wait was the top performer, crossing the line in 3:09.22 and finishing sixth in her over 50 category. Flo Brill of Nene Valley Harriers finished 18th in the Under 13 Mini-Marathon and she was third finisher out of the Eastern qualifiers.